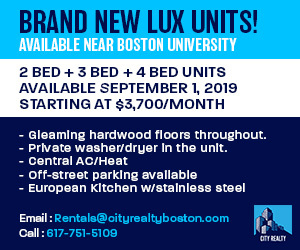 A power outage hit some of Boston University’s South Campus residences, including buildings on Beacon Street and Buswell Street, for almost seven hours Wednesday. 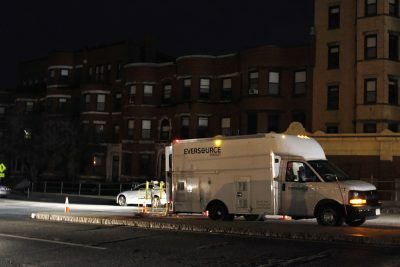 The outage started at 1:08 p.m., according to energy provider Eversource’s website, and power returned around 7:50 p.m., eyewitnesses said. A cable failure caused the outage, according to an Eversource worker on site. South Campus resident Jessica Taylor, a senior in the Sargent College of Health and Rehabilitation Sciences, said she could not cook dinner due to the outage and had to go out and buy food. Wireless internet access was also spotty, she said. Taylor, sitting on the stairs outside her darkened residence, said Wednesday’s mild weather made the outage a little more bearable. “If the power was going to go out, at least it was today,” she said. Author: Jen RacoosinJen is a sophomore in the College of Communication and the Campus News Editor for Fall 2018. Follow her on Twitter @jenrac9. It is out again right now – 12:45pm 11/9/2018.